Students at Adrian Elementary School are busy preparing for the Annual Science Showcase, which will take place on Thursday, March 21st. The annual event is a voluntary and non-competitive event which provides Adrian students the opportunity to perform a science experiment and demonstrate the results through an interactive and informative display. All participating students follow a specific scientific process while conducting their experiment. The first step involves formulating a question or “big idea” which the student will seek to answer as a result of their experiment. The second part of the process requires the student to make a hypothesis or prediction of the outcome of the experiment. Once the student has defined the question they wish to answer and predicted the outcome, they can then gather necessary materials and record all required procedures to complete during the process. Finally, the student is ready to conduct the experiment, during which they record all observations and results. The final step involves summarizing the conclusion to their experiment, including describing what they learned and if their prediction came true. 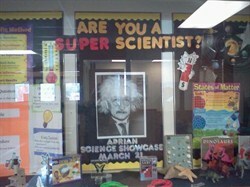 Teachers, students, and parents will be able to view the results of each student’s experiment at next Thursday’s event. Best of luck to all students participating at the Annual Science Showcase!